Balaraman Jayaraman (Bala) began his journey at Congruent Solutions since 1999 after acquiring a part of the equity. He relocated to build the US subsidiary in 2000 and grew it significantly and the company became more US centric. 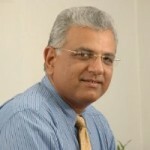 He had a good amount of outsourcing experience from his past stint in the US in the late 80’s when he was instrumental in several leading Silicon Valley companies like Chips & Technologies, Mips Computers and Mylex Corporation take their initial steps into off-shore outsourcing through Indchem Electronics, for whom he set up the US operations. As Congruent began getting traction in a few verticals, Bala began analysing domains that were being serviced by them and found that the Back Office Pension Administration was an area that that was untapped and realized a huge opportunity and added a service line in that area. Congruent Solutions began providing Soup to Nuts services for the back office in non-customer facing operation such as compliance testing (one of the very few companies in the world to handle this process from an offshore location). The team at Congruent became competent in offering this service and they began picking up lots of customers. They also got involved with SPARK (Industry body for Pension Administration) and their Executive Vice President in the US, San Asuti, has been the board member in SPARK for the past 8 years and was listed among the Hundred Most Influential Contributors in the Defined Contribution space in 2013. Bala and the core team began interacting with the C level buyers in the industry and they found out a key need – the industry was hurting for a modern record keeping platform. Most of the platforms were 20 years old in the industry and clients were paying Tens of Millions of Dollars annually for the upkeep of these platforms. And suffering from their inflexibility as well – for example, updating small rule changes would take months to incorporate into these systems. The clients had little choice but to put up with this because there were no alternatives. By virtue of their operational experiences in the same space, Congruent understood the nuances of challenges and the limitations of technology and, one bright day, they decided to build a next generation platform for the industry which was a huge ask because this was like building an ERP from scratch. They still realized the huge potential of the market and decided to take the risk and started the product development in 2010 and it has taken this while to put together the product and to mature it. Bala talks about the innovations and the risky decisions they took to be a pioneer that helped build the rock solid product that is there today. One decision was that it should be modular in nature. They kept it so easy that the clients can still take a part of the solution from Congruent and can integrate that with their existing system even if they do not want an end to end replacement of their legacy record keeping system. The second decision was that the product was built to be easily adaptable to other countries’ rules as well as support multi-lingual capabilities so as to address markets beyond the US. This specific approach was a result of a research of the global pension landscape. With lifespans increasing, the employers ended up spending more and more for the traditional Defined Benefits pension schemes. In the late 1970’s and early 1980’s a few countries, including the US, introduced Defined Contribution where the contribution is defined but the final benefit is a function of the investment choices the clients make. The uniqueness of the platform is the architecture of the core product being the same for different geographies but the implementation of the rules will be external to the code base which allowed configuration of the product to their needs so easily. Bala also recollects the other decision they took was to adopt the Microsoft platform which allowed them to support multi-lingual which many customers loved. The clients loved this because they could not believe that a Spanish language screens could be switched on the fly. Bala says that the team could anticipate the need for such an enterprise solution because Congruent has been working with the people in this vertical for more than a decade and solving a lot of other operational problems for them. But all along, Bala was clear that the product built by the Congruent team would be best of breed and make a business impact for their clients. Bala says that one of the important first step they took was to hire a very seasoned senior operations executive with over 20 years of experience in the operations of a large Tier 1 provider which was exactly the market they were going to address, to articulate the functional requirements in detail. Bala also says that “We didn’t know what we didn’t know and hence did not want to be limited by our view of what the product should and should not do”. They, therefore, decided to get an outsiders’ perspective on the product functionality. As the product development unfolded and they demonstrated the product to some important prospects, it was becoming clear that the market was taking them seriously, but things did not go the way they wanted and it soon became apparent that it was the GoToMarket approach that needed fine tuning. Bala recollects the first situation when they were bidding. They were on their own as a startup product company and met the customers on their own and began selling the COREDC product. They got their first opportunity for an end to end product situation where there were five large competitors. Congruent cleared the various stages of the evaluation in the RFP and was rated as a better product in the final short list of two. When they were about to be called in for signing the contract, the risk perception to deal with a smaller company was brought up and they lost the deal. They realized that the company that won the deal won it because they were a large player and the client had the trust that they will not fail but the product was nowhere near what Congruent product was offering. This made them realize that they should work with partners and they scouted around the market and aligned with CTS. CTS saw value in their product, evaluated this well for around two weeks and was happy to become a CORE Solutions Implementation Partner. Their sales teams liked the product and began taking them into CTS key accounts and working together to communicate the value proposition and that is how they got the first customer together. Bala says that the team also had a choice to make. Should they be targeting all layers of the market from a large provider (typically Fortune 1000 companies) which will have a longer sales cycle to the smaller TPA’s with shorter sales cycles to get some initial revenue to keep the momentum in the market going and build the morale of the team? He took a hard decision by targeting the first few sales only with larger customers. He knew that the customer market perception point of view will make it very difficult for them to climb the pyramid and get to the top if they are perceived to be a small company provider, a SME product which will never be evaluated by a large company. They waited, built the product, partnered with a large company, got the first sale from a Tier 1 company and even today they focus only on companies having a couple of hundreds of thousands of participants to around 15 million participants in DC. Bala says that they found that clients were used to their legacy systems inspite of the shortcomings and Rip & Replace was not an option they preferred, but clients will be willing to do the replacement in a modular fashion. What has worked for them is that from an architecture point of view where they can break the entire product into point solutions and gradually have the client adopt the solution in stages. And the possibility of adaptation of the product in multiple geographies is a huge advantage for the future expansion into other markets globally. They have a direct sales force also and bring in the partner if required and the partner gets them in if needed. According to Bala, having partners like CTS provides an umbrella of confidence to the customer. None of this is a 100 meter dash, the entire journey is a marathon. People have to be prepared for the long haul. We do hear that a few startups have made it big once in a while but by and large, these situations are test matches and not a 20/20 match. So one needs staying power, and a strong belief in what one is doing but that belief should not be blind and one should have a third party validation. Finally, one key message: If the market is not receptive to what you have built, it does not matter what you build.